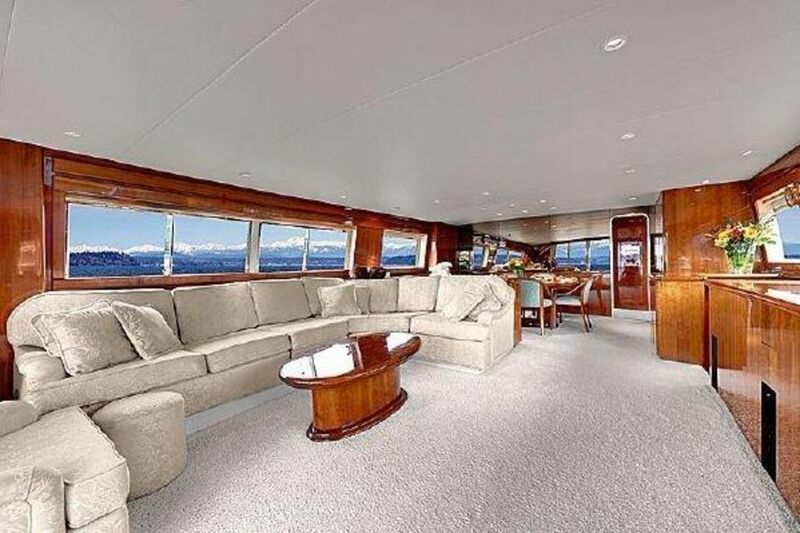 Private yacht, with 6 staterooms or cabins, plus 7 heads (toilets ) Large fully enclosed sky lounge for evening viewing of all the beautiful Lake Union sites. If the weather is good, you will love the outdoor upper deck, or spacious lower rear decks. 3 ice makes, 2 wet bars, large galley with a large double refer, microwave, dishwasher. Master suite has 2 private heads. 2 sets of washers and dryers. Life long boating family , with 30 year on the water. we always try to do everything we can to make your waterfront stay enjoyable. Your own private yacht , at the Seattle water front of Lake Union. Best view and best location of any property listed. My opinion, but the truth. There are no hotels with this view, and you will love it. Great view of Seattle sky line , and view of Lake Union. only on the far rear deck , or the bow, but not anywhere inside. If you are just looking for a party venue, please explain how many will attend, the hours, reason for party. Owners discretion on parties. Beautiful yacht, spectacular views and great location!! We used this property for our family attending a wedding in the South Lake Union area. Overall the yacht was very comfortable and clean. The staterooms were very comfortable, the kitchen was well equipped and the lounge areas were large and expansive for groups to get together. Each day at least one or two in our family would marvel how perfect a place this was to stay in. Chuck was very thorough, responsive and a gracious host. We would love to come back! Thank you Captain Chuck for having us as your guests on this stunning ship - people loved the experience. We appreciate your quick communication regarding all of our questions and highly recommend the ship to others! What a great alternative to staying in a hotel, and you can't beat the views of beautiful Seattle! Thank you again. Very clean...plenty of space for the eight of us. We were traveling with our 82 yr old mother. Although there are many very steep steps within the yacht, she did very well & especially enjoyed the master bedroom...a “Queen’s” space for sure. We ordered take out a couple of times which enabled us to enjoy the upper deck space, the views & a quiet space for conversation. We thoroughly enjoyed our stay. Thank you to Chuck! Phenomenal experience in every respect !!!! Chuck is an exceptional host and guide. Accomadations are luxurious and spacious. We had a family (and friends) outing to a concert downtown, and this was the perfect addition. Close to everything, incredible amenities on board, and our host was the absolute best. If this boat is available for your trip - book it! This is a real gem of an opportunity for those interested. This is the best of all worlds with an exceptional view, top notch accomodations and centrally located on Lake Union. We had an absolute blast and could not have imagined a better experience. Skip renting multiple houses for a group and step up to the best of all worlds. The boat is impressively appointed and maintained. The Yacht is located in South Lake Union , with views of Downtown Seattle. Close to South Lake Union Trolley service to Westlake Center, Seattle Center, Pike Place Market. There will be full instructions on running all on board systems, heads, TV, Stereo, deck lights, appliances, etc. I will always just be a phone call away.